Due to the number of requests, this game is now open to members only and will go to ballot. This will be carried out this weekend and notifications to those successful will be completed by Monday. If you do not receive notification by Monday, your name will remain on the reserve list just in case more tickets become available. If you are not successful from the ballot and DO NOT wish to remain on the reserve list at any point, please text Chris Alexander and notify him. This is an unfortunate situation but there has been an extremely high demand for this game. We thank you for your patience and understanding in these situations. The Premier League have advised the following dates as when TV companies need to make their decisions on live matches. From past experience these dates can drift a bit and of course they are still within their rights to make further changes after the deadline dates, but at least it gives us all some guidance. 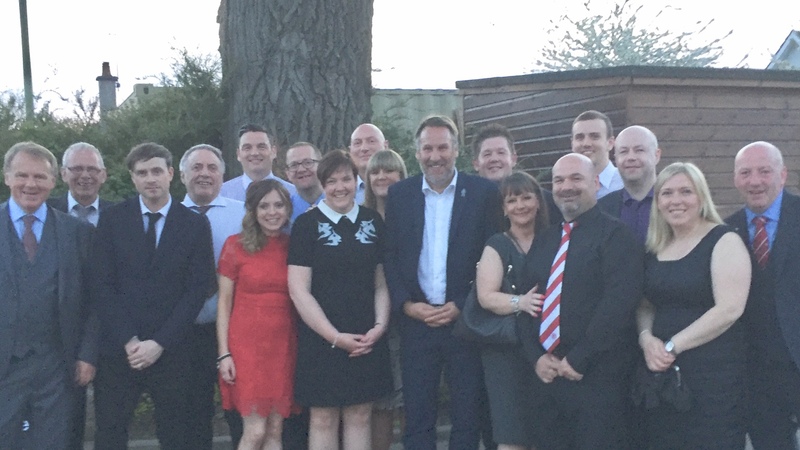 It was definitely a night out that a small contingency of ASSC members and some partners were looking forward to. I don’t think any of us realised just how incredible it would be. Many thanks to Dundee Northend FC who organised a fantastic function which was made all the more appropriate as they celebrated winning their league cup – congratulations guys! And what better place to celebrate than the Invercarse Hotel. With stunning views from the ballroom, excellent staff and service with wonderful food – highly recommend it! With Tam Cowan as MC (and all round funny guy!) and some sporting humour from Paul Reid the night was a complete hit. 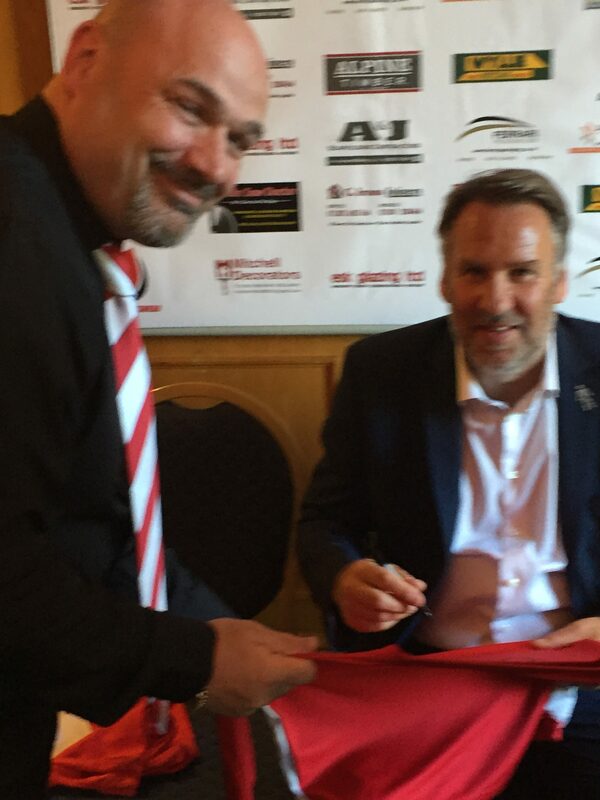 Ladies and gentlemen, this was Mr Paul Merson! As VIPs, the Arsenal contingency had the privilege of a more exclusive meeting with the Legend himself before our meal. Those quotes are real and were expressed with sincerity and came from meeting Paul and watch him greet everyone personally, giving them time to chat, get a signature on a shirt or a programme, have a laugh and just generally get to know the guy. 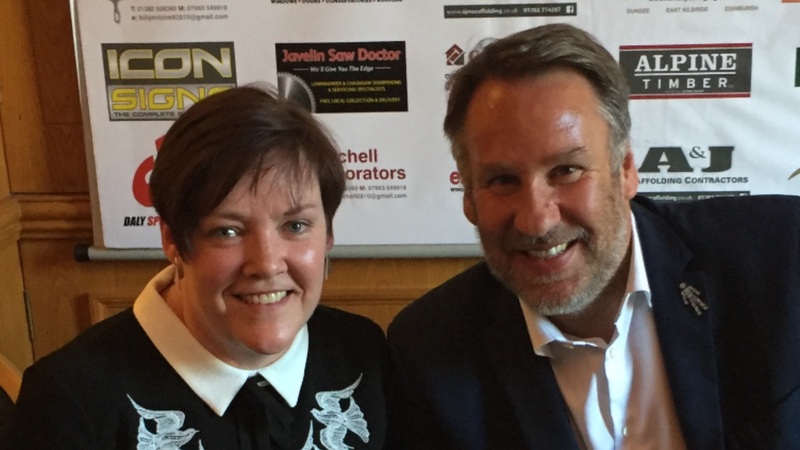 We hadn’t considered impinging on anyones time with Mr Merson – we were only a small group amongst 320 guests. But with some time to kill at the table we found ourselves another opportunity (well, if you don’t ask, you don’t get) and next thing we know, we are heading outside (his suggestion I believe) for the group photo! His courtesy and enthusiasm never swayed and although I’m sure he had no idea what some of us were saying, there was a few giggles and a lot of smiles from the cheeky No 9! After a brilliant meal, it was time to hear from the man himself. This was where a lot of those earlier quotes came from. Honest, funny, humble, great, a pleasure to meet, a down to earth guy. I could have listened to his stories all evening. So what can I say that hasn’t already been said? 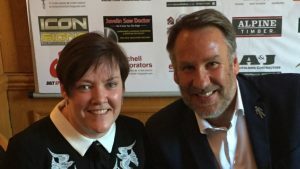 Paul Merson is one of the nicest people I have ever met! Not only a legend, but a gentleman too! Thanks Paul – it was an absolute pleasure! The minutes of the meeting held on 3rd Febtuary 2018 are available on the “Rules and Meeting Notes” page. Enjoy! Martin O’Donnell shares hisxexperience of Sweden! How was Ostersund? Thats the question I’m often asked. From the locals perspective it was by far the biggest football event for their wee local club, EVER and so the whole Town and local population were all in on this weeks visit of Arsenal. Everyone of all gender and ages were backing the game, of course the vast majority backing the local team but quite a few backing their favourite team Arsenal. Most of all I guessed that they didn’t want to be embarrassed by their football club and hoped for a tight scoreline. They are very proud of what OFK have done over the past seven or eight seasons and just 22 years since being founded! From the Gooners perspective we were in a friendly comfortable Town about the same population as say Welwyn Garden City in England or say Livingston in Scotland with no trouble at all. Everything you wanted was well within 5 minutes walking, anywhere! All the fans mixed going to the game with the locals making sure that Gooners were shown where to go and how best to get there. I just went on the local bus, nobody walks to the stadium cos of the snow. Got there in ten minutes and twenty minutes coming back. Plenty time to get back to the pub. Yes, beer and spirits are expensive, very expensive, £7 to £13 a pint for local pale ales to craft biers, but if you be sensible about it you can enjoy a few well chosen beers and engage in good conversation with the locals. If you are planning to get bladdered, either take out a banking loan or just forget it. I had enough beers and gin to make me warm and mellow two nights running. I still headed for home with spare cash. Arsenal Sweden put on a big effort to gather as many Gooners as possible in the local bars and they produced an unofficial programme just for the Gooners. Anything you needed to know Arsenal Sweden had the answers. Well done Arsenal Sweden. Us Gooners were greeted with sincere warm friendship and people wanted to speak to us everywhere we went, be it airport staff, bus drivers, taxi drivers, shopkeepers, receptionists, bar staff, waitresses, kebab shop staff ( well you just have to after a few lagers, don’t you?). The local folk went all out for this with flags and scarves or wee teddy bears wearing the game details in every shop, bar, cafe, etc. In fact every retail shop had some OFK or Arsenal colours on display somewhere. The Town Council must have played their part as every second lamppost in the Town Centre precinct had very official looking pennants hanging from then. It was like a mini Olympics had come to town. What they all wanted to know is the same question above. How was Ostersund? Few outside Sweden know much about the Town unless you are into Winter Sports in which case its a top destination for tourist and professional skiing, snowboarding and stuff I just don’t know anything about. The locals were really proud of the Town and the football club. They were happy to be seen as friendly and welcoming and yes they do want us all to come back and enjoy their winter sports and their forests and lakes in the warm summer months. They want us to tell all our friends how nice a place Ostersund is. Well they have my support on that, without a doubt. As my travels are focused on football or warm destinations I cannot honestly say I would travel back again, but if you like sliding down hills or enjoy the great outdoors then this is the place to come to for sure. The Town is the Easter (oster) end of a strip of freshwater or Sound (Sund ) on the 5th largest lake in Sweden. I haven’t checked but I thinks its over 30 miles end to end which is at least a third longer than Loch Ness for example. The architecture is pretty but not ancient as the Town was only founded in the late 1770’s. Its Viking country, so museums and heritage tend to cover that field of history. But its the people that impressed me most. They all speak perfect English of course and some understood my ‘scots’ accent even more than english vowels. Very nice people, a very clean and pretty Town in spite of the snow everywhere. Its dry snow , not like the wet slushy brown shitey stuff that we have back home. You are not wading through puddles of muddy water dragging it into every shop and bar you enter. In Ostersund it was clean dry white snow, except where passing dogs had stopped briefly! 😂 Yeeeeellloooooooowwwww! 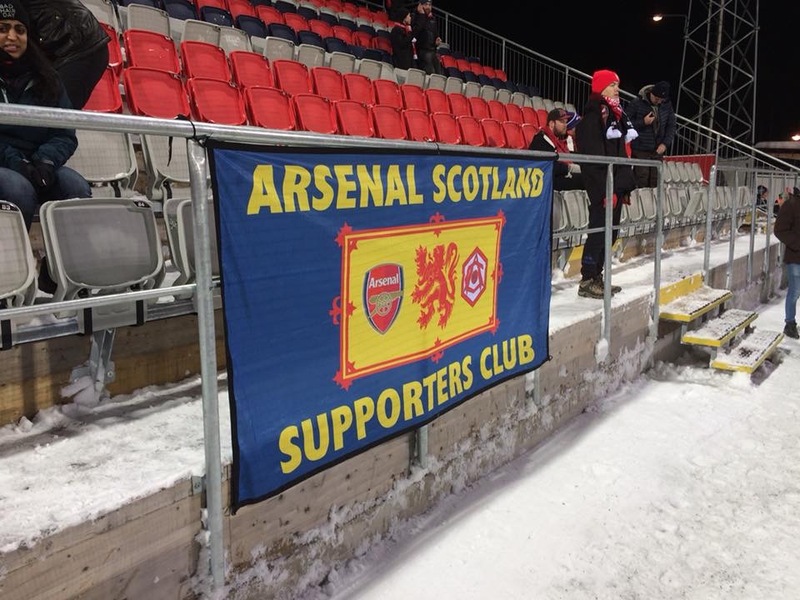 Some Gooners were worried about getting to Ostersund or the game being called off due to the snow. Eh! No! This is Sweden! The Swedes don’t mess about when it comes to snow and ice. If its icey then they dump tons of rock salt and grit everywhere. If its snow, then the Swedes have convoys of snow moving vehicles that shift it completely. Airport runways, roads, side streets, pavements are all cleared and regularly. I even watched a mini dumper truck squeeze up and down a tiny alleyway at the back of a hotel so that service vehicles can get in . Would they do that in UK Blightly? Would they balls! Everyone has winter tyres on their cars and trucks. Not once did I see any vehicle get stuck or slide about. Not once. Also, even though we were basically walking about on a layer of ice with hard packed snow on it , I never once saw anyone slip, not even half pissed Gooners! No! Snow is not a problem in Sweden. They just deal with it. The Jamtkraft Arena was ten minutes on the bus. A small but well equipped 8,000 seater although I gather that somehow there were 9,000 and something in last night which I think must be their attendance record. There was snow on our stand behind the goals but it was such hard packed icey white snow it was like gravel ashfelt. The bits of snow on the seats were actual rock hard ice that you chipped off with a coin if you needed to. As usual on away games most of us stood anyway. Hot drinks, burgers and hot dogs on the go. Being just 1500 Gooners there was time to catch up with everyone and I even had a couple of long chats with our Liaison Officer at Arsenal – Mark Brindle, in the pub and again on match day at the stadium. Normally we never have time for a blether. Mark was sporting the official big Wenger zip up coat! I went prepared with layers on and thermals ‘breeks’ which I have to say were ideal for the task. But the temperature during the game was about -4 so not as bad as it might have been had we played last week when it was -24. As for the game, Ostersunds FK did not disgrace themselves at all. They played well but for a few referees decisions , an own goal and the penalty save they might have got a deserved and closer result to take to the second leg in London. Which for by the way, they have sold all 5000 tickets for that game, so they are having a party in London. I imagine that the Gooners will give Ostersund folk a welcome to Islington next week. Great memories of a special day just before Christmas 2017. 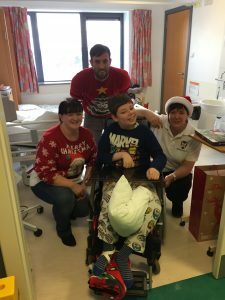 ASSC members Caz, Linda and Kevin, with the help of a donation from ASSC, presented the Royal Aberdeen Children’s Hospital with 2 much needed portable DVD players and some Christmas treats for current patients on the Medical Ward. Many thanks to patients and staff who welcomed us and spent time with us. It was an absolute joy. Just hope they all enjoyed it as much as we did! This is Aiden who made us feel very welcome and showed us some great Christmas cheer! More photos going on the Gallery page if I can figure out how to get them on there! The Romford Pele at Grampian Gooners! It’s only Ray Parlour… at Grampian Gooners HQ! It was an honour to welcome a true Arsenal legend to Grampian Gooners HQ (McGinty’s pub in Aberdeen) for a sportsman’s lunch on the 25th November 2016. 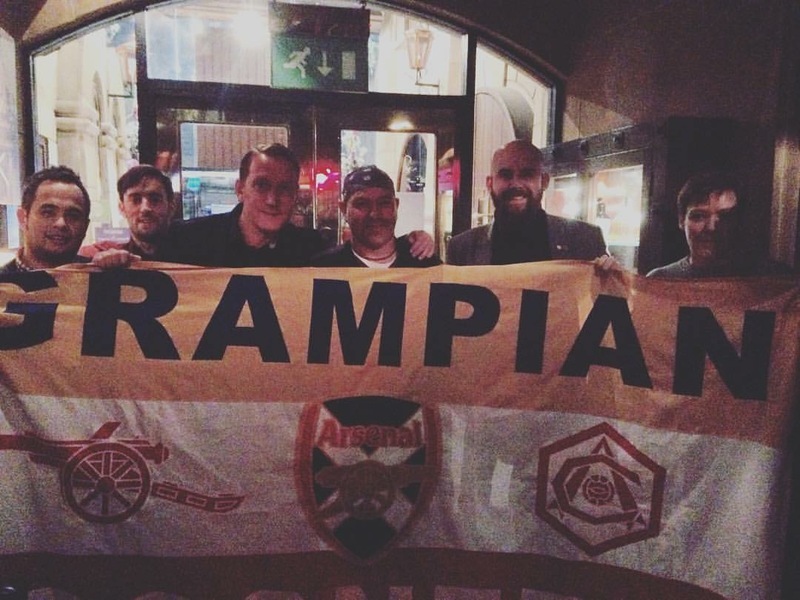 Given that we have met up to watch games at McGinty’s pub on Union street Aberdeen for just over a year, it was great to have Ray Parlour in our so called home where he made time to speak to all of the Grampian Gooners personally. He was very down to earth and funny and I enjoyed a good chat with him over a pint. His after dinner speech was full of hilarious stories about his time at Arsenal which everyone enjoyed. He loved that he was visiting a pub where an Arsenal supporters’ group call home and we got a group photo of the Romford Pelé with some of Grampian Gooners present, holding up the Grampian Gooners banner. This is John Sowman, lifelong Arsenal fan and author of the recently published ARSENAL: The Long Sleep 1953-1970, at 384 pages, the biggest book ever written about Arsenal Football Club. Bob Wilson, your Life President kindly agreed to write the foreword and we made a joint presentation/book signing at the AISA (Arsenal Independent Supporters Association) AGM in London on 6th September last. AISA,of which I am a member, also made a similar cheque donation to yours to the Willow Foundation on that night and I was able to make my own first donation to the same charity from royalties from the book and the Kindle version. What I am asking is would it be possible for you to make all your members aware of this new publication through my new website www.arsenallongsleep.co.uk ? On it they would be able to see what the book is all about and read how Bob has really enthused about it. And hopefully, even make a purchase ! Many thanks in advance and hoping to hear from you soon.